Leading Manufacturer of glycol chiller from Thane. We are presenting a wide assortment of Glycol Chillers. The offered chiller is equipped with agitator, coil, control box, stainless steel frame, and OEM approved components. 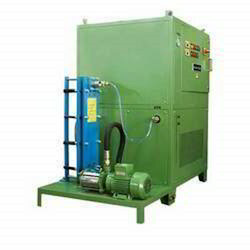 Offered chiller is manufactured using stainless steel materials and approved electrical components. Provided chiller is largely utilized in shops, and commercial arenas. Clients can get the chiller from us at industry leading rates.